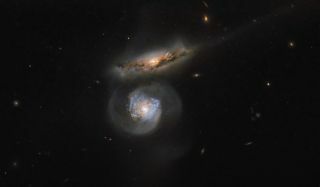 NASA and the European Space Agency released an image of galaxies MCG+01-38-004 (top) and MCG+01-38-005 (bottom), which are located in the constellation of Virgo. Their megamaser cores emit radiation to nearby clouds, which then absorb the energy and send it out as microwaves. A new image from the Hubble Space Telescope depicts the intense hearts of two galaxies MCG+01-38-004 (red appearance) and MCG+01-38-005 (blue appearance), which blast out radiation from the constellation Virgo. By studying the emissions from so-called "megamasers" in the centers of certain galaxies, scientists can achieve a more precise understanding of how fast the universe is expanding. If you've ever looked into a prism, and seen the light breaking out into the colors of the rainbow, you've viewed a small part of the electromagnetic spectrum. The electric and magnetic waves of this spectrum range from high-energy gamma-rays at one end, through visible light waves, all the way down to lower-energy microwaves and radio waves. The radiation produced by microwave appliances can also be produced by activity at the center of galaxies, such as those captured by the Hubble Space Telescope in the new image, released Sept. 1 by NASA and the European Space Agency. Masers and megamasers can be found at the intense centers of certain galaxies, and are sometimes composed of gas clouds that contain molecules of water and methyl alcohol. When local phenomena, possibly including supermassive black holes, stimulate these clouds, they radiate large amounts of energy. According to the statement, the hydrogen and oxygen atoms of the clouds' water molecules absorb some of this massive energy and re-emit it, and it is these microwaves that scientists observe with microwave detectors — although Hubble itself can't see them. Although Hubble can't detect microwaves, the telescope's namesake, Edwin Hubble, is relevant to the discussion of microwave detection. Hubble's most important contribution to astronomy, the Hubble constant, is being redefined by the study of megamasers like those found at the center of these galaxies. According to the release, the microwave emissions from galaxy MCG+01-38-005 were used to fine-tune the value of the Hubble constant, which measures how fast the universe is expanding.